This time last year, I was recovering from two full-on weeks at the annual climate summit – or CoP – which had just come to an end in Warsaw, Poland. There, in the slightly surreal and wintry setting of the national football stadium, we were plied with pisco sours by this year’s conference host, Peru, and dreamed of sunnier climes. One year on, I’m reflecting on the outcome of the recent Meeting of the Parties (or MoP) to the Montreal Protocol in Paris, and still dreaming of sunnier climes from my desk in a grey-but-not-quite-wintry London. I won’t be heading to Peru, where countries are meeting from December 1-12, but I will be following proceedings very closely given the strong connection between the climate and ozone regimes. 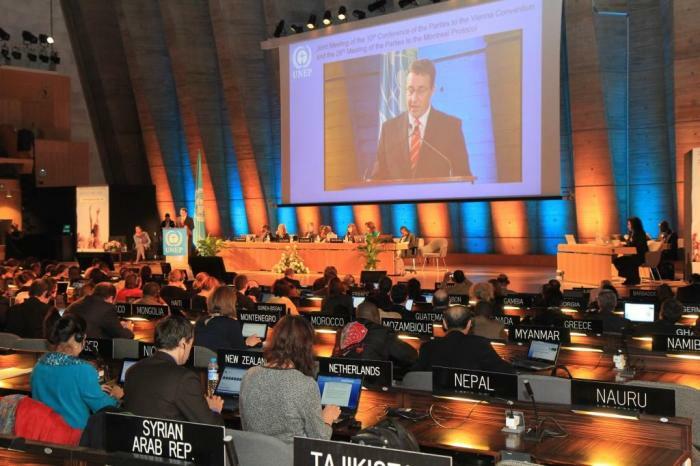 At the Paris MoP, the world edged a couple of steps closer to a global agreement on hydrofluorocarbons (HFCs), the super greenhouse gases which will add at least 0.5°C to the average global temperature by 2100 if left unchecked. If that doesn’t sound like a big deal, consider that scientists have identified a ‘mere’ 2°C temperature rise as the threshold beyond which cataclysmic and irreversible climate change will kick in. A number of developments during the Paris talks gave rise to optimism that the global community is finally getting its act into gear on HFCs. A new concept put forward by the European Union, which builds on proposals to phase down HFCs tabled by the North American countries and Micronesia since 2009, was favourably received and Miguel Arias Cañete, making his first international appearance as EU Climate Commissioner, confirmed that the EU was considering a formal proposal in 2015. Despite vocal resistance over the course of the week from the Gulf States (spearheaded by Saudi Arabia), other countries including India and China displayed a markedly more constructive attitude than at previous meetings. In a sign that India is moving into negotiating mode, Prakash Javadekar, Minister for Environment and Forests, flew in to deliver an interesting and nuanced speech calling for a “revolution on climate change” at the Paris climate conference in 2015 (CoP21 for short) and clearly acknowledging the problem posed by the proliferation of HFCs. He rounded his address off with a list of specific asks, including more trialling of alternatives to HFCs in India, and technology transfer between developed and developing countries, noting: “What is the use of those confidentiality and IPR [intellectual property rights] issues if all of us are going down together due to global warming?“. Many observers (including EIA) have lamented the way countries such as India have “played off” the Montreal Protocol against the climate regime, holding up progress on HFCs under the former in the hope of extracting concessions on separate negotiating priorities under the latter. The political scientist in me finds it fascinating to witness the slow but inexorable shift in countries’ positions as we head towards the conclusion of a global climate agreement next year. However, my inner environmentalist jumps up and down in frustration at the fact that every year that goes by without a deal to reign in HFCs is another year lost in the increasingly difficult struggle to contain climate change. As we saw in Paris, multilateral action on HFCs has the support of an overwhelming majority of nations; 2015 will be the year to translate that majority support into a meaningful agreement. With an additional session of the Montreal Protocol planned for April, even habitual pessimists are saying there are prospects for real and exciting progress. Watch this space.